Is it true? Could it be? Could the Steven Stamkos that we all came to know and expect be truly back among the hockey elite? Of course, the answer to that, at this particular time and place, is yes. Stamkos is running hot and the hockey world is a much better place for having him back. Of course, everyone except for Derek B. is kicking themselves for not picking him up at the draft, when we all had at least one shot at doing so. Stamkos finished Week Three with 11 points in four games played, bringing his totals up to 18 points in nine games, registering at least a point in each of those nine games, starting off the season with quite the scoring streak. His week started off with a pair of assists against the Red Wings on Monday, followed up by a goal and a pair of assists against the Devils on Tuesday, another pair of assists against the Blue Jackets on Thursday and finally, a goal and a trio of assists against the Penguins on Saturday, giving him 2 goals and 9 helpers in those four games. For Derek, his 2nd round draft pick is now quite the bargain pick, as Stamkos now leads all players in scoring with his 18 points, which is pretty darn good for being the 46th pick overall. Most teams in the draft had two cracks at picking Stamkos this year, but his injury prone nature was obviously enough to see him fall at the draft. Derek's team has been much better for the bargain as well, finishing the week in 5th place, only 9 points out of 1st. The Mover & Shaker nod, however, needs a bunch of players to hit their stride at the same time, not just having the best player in the pool and being satisfied with that. Wes' team hit their stride, for the most part, in Week Three, as 12 of his 14 players were able to pick up points in the week and his team finished with a pool-high 35 points and his team shot up the standings, going from 22nd to 10th. 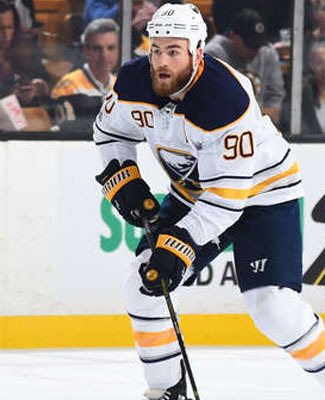 Wes' top player in Week Three was Ryan O'Reilly of the Sabres, his 6th round pick, who finished with 5 points. Sven Baertschi of the Canucks, Derick Brassard of the Senators, Jack Eichel of the Sabres and Jacob Markstrom of the Canucks all finished with 4 points a piece in the week, helping to guide the way for his team. It was definitely a solid effort all around from some of his top players. Wes' team has been bouncing around the standings in the first three weeks of the season, finishing Week One in 11th, down to 22nd in Week Two and now back up to 10th after this week, the early pattern would suggest his team is going to take a tumble, but that's up to his team to decide. The goal scoring race was one of Wes' stronger points this week, as his team was tied for the pool lead in goals scored, tied with Tony with 12 biscuits in the basket, and his team is now tied for 11th in the category after the week. Staying healthy is also quite important, not to mention getting the schedule to work in your favour, which seemed to work for his team this week. Wes' team was tied for 9th in skater games played and 2nd in goalie minutes collected, which certainly kept him in the race in a very quiet week in the schedule. Let's see how his team can follow that up in Week Four. It may have been a bit of a rough start to his first season in the hockey pool, but that could be the trick about trying to figure out the nature of this game, as the others who have been around the pool long enough, have maybe developed a bit of a pattern of picking, which Steve may not have found just yet. His team was suffering a bit, thanks to some poor luck, starting with injuries and roster moves and they were only able to pick up 13 points in Week Three and he found his way to the Basement Dweller nod. Steve had three players lead the way, 3 points each for Johnny Gaudreau of the Flames, Zach Hyman of the Maple Leafs and Connor McDavid of the Oilers, but half of his team were unable to post a point in the week, the biggest downfall to his team. The biggest hole on Steve's team to start this season is his goaltending, as he has only posted one start, which came this week out of Peter Budaj, but with Calvin Pickard in the minors for the Maple Leafs to start the season, it wasn't what he was expecting out of the projected backup for the Vegas Golden Knights. There's still a lot of the season to be played and there's still some luck to be had, I'm sure. If not, Steve will have to find his way into some players that have a good plus/minus rating, which he appears to be still in the race there after three weeks. Jeremy's team took a bit of a tough week on the chin, as they were only able to post 18 points in Week Three, which meant that his lead shrank significantly, going from 15 points to 6 points and now 10 points is only good enough down to 6th place in the standings. Chris and Brian still sit in 2nd and 3rd, although Chris has unseated Brian for 2nd place this week and he currently has a 2-point gap for the next best money spot. The money race is looking pretty good, as 10 points gets us all the way down to 11th place, so a monster week would go a long ways to get into the money weeks. It's still rather exciting. It was a sharp week in the goalie survivor pool, as four more teams got cut from the mini-game, as Ryan, Derek B., Scott B. and Dale C. were all unable to register a win. So, now we're down to 11 teams in the survivor pool only after three weeks worth of action. Wilton, Jeremy, Mike, Stacey M., Chris, Cam, Benson, Grant, Tony, Stacey C. and Brian were the 11 teams to qualify for Week Four, pretty much in that order this past week. Now that we're cutting down teams at a quick pace, it makes the goalie announcement posts that much shorter. Week Four appears to be on the difficult side for both Jeremy and Cam, as they both are at the bottom of the totem pole for projected starts, each having only three possible opportunities for wins in Week Four. Everyone else is rocking six possible starts or more, just by comparison. It was a rough week in the plus/minus department, as the entire pool did a collective -40 through all 25 teams, as only 10 teams finished even or better in the department, meaning that there were a lot of teams taking some real setbacks. Kristy & Don and Eric's team were tops in the week, both finishing +9 in the week and they now sit 1-2 in the standings, while the Week Two leader, Grant, had a horrible week in the category, finishing -9 and his team is now 4 points back of the new leaders. On the other end of the spectrum, Stacey M.'s team is now -23 and Troy's team took a tumble into 24th, now -18 overall. It was a bit of a bounce back week in scoring for the hockey pool, as we saw 13.3 points per NHL game, while participation remained the same for our skaters, but we lost a few average minutes in the goaltending, thanks in part to the injuries that had occurred in the week. If we had those goalie starts, we would have been more likely to get closer to the 14 points per game we were looking at in Week One. This week, we're back up to 47 NHL games on the schedule, so we'll see a few more points, hopefully topping the 627 total points we saw in Week Two. The Calgary Flames opened up the Monday morning portion of the news with placing Jaromir Jagr on the Injured Reserve with his lower-body injury. Jagr was injured on Saturday night against the Wild and this now allows the team to call-up AHL standout Mark Jankowski to fill in a gap down the middle. This move will be retroactive to Saturday night, which means that Jagr could return again on Sunday with the Capitals in town, if he's ready to go, but I probably wouldn't be so quick to assume his return will be right away. Tough break for Ryan's team, which could really use a better break right now. His team opens the week in 22nd place, 22 points back of 3rd place.